Two pottery figures of a soldier and a male attendant respectively, both standing upright and looking straight ahead. The soldier wears a long-sleeved, layered robe with large collars and with a belt tied around his waist; he holds an oval shield in his left hand whilst his right hand is clenched in a fist as if holding another weapon, probably a spear. The attendant is dressed in a long-sleeved robe and wears loose trousers. A knotted cape covers his shoulders; he holds with both hands a rectangular box which he supports on his waist. Both figures have stylish hair arrangements and a well-defined expression, whilst the soldier appears to have more prominent facial features. Some traces of red, white and black pigments are visible on both figures. 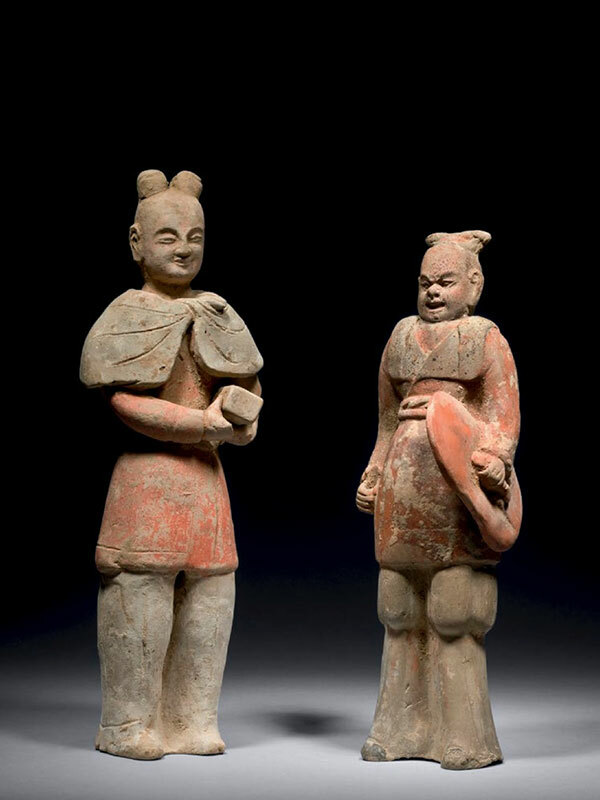 These two vivid pottery figures are fine examples, representing different social types living in the Northern Dynasties. Warrior figures began to be popular during the Northern Dynasties (439 – 581), and commonly represent the prominent look of northern nomads. Two closely comparable Northern Wei pottery figures, with a soldier holding a shield in his left hand and a female attendant similarly carrying a box beside her left waist, were excavated from Yanshi, Henan province in 1989 and are now in the Yanshi City Museum. A very similar pottery solider with shield, dated to the Northern Wei (386 – 534) to the Northern Qi dynasty (550 – 577), the mid-to-late 6th century, is in the collection of the Metropolitan Museum of Art. A number of comparable pottery soldiers, dated to the late Northern Wei dynasty, were excavated from Luoyang city, capital of the Northern Wei from 494 to 534.